For cases received before 1 January 2016 or 1 January of the year of joining the BEPS Inclusive Framework (IF membership), each jurisdiction can follow its own computation rules to determine the time needed to close the cases. The notes of each jurisdiction's statistics should escribe the computation rules that were followed. Note: The application of these computation rules may result in negative numbers. This can for example be the case when a MAP case is closed before the theoretical start date computed further to these rules. It was agreed to replace such negative numbers by a "nil" timeframe to avoid biasing the average timeframes. Therefore, there may be instances where the reported timeframe is "nil". For cases that started before 1 January 2016 or 1 January of the year of joining the BEPS Inclusive Framework (IF membership), the total average time to close MAP cases from start to end is available. Such information is available per type of MAP cases (i.e. 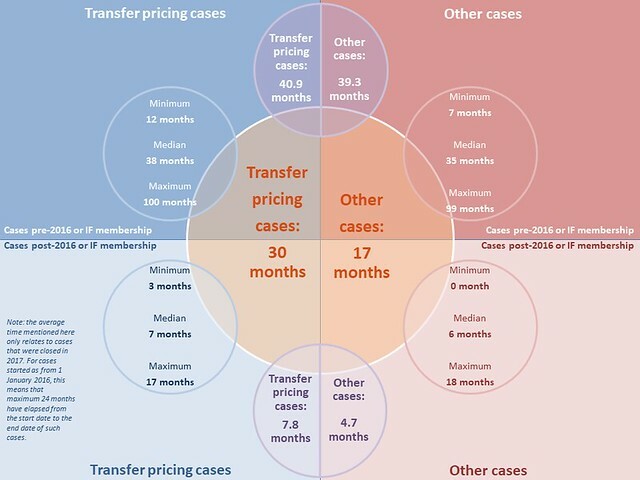 transfer pricing cases and other cases). the breakdown of the average time needed from start to first milestone and from first milestone to end, when applicable. In this respect, the first milestone captures the presentation of a position paper by one competent authority to the other competent authority. In order to compute the relevant weighted average of times involving a Milestone 1, the number of cases taken into account are those that were closed with a Milestone 1 per treaty partner, if any. Due to this difference in concerned cases (all cases closed vs. only the cases closed with a Milestone 1), the sum of average times involving a Milestone 1 (“Start” to “Milestone 1” and “Milestone 1” to “End”) may not equal the average time from "Start" to "End". This information is reported by each reporting jurisdiction per type of cases and per treaty partner or per category of treaty partners. While, as far as 2016 reporting period is concerned, the breakdown of such information per treaty partner or per category of treaty partner was not published, it is now available for 2017 MAP statistics for the first time. The average times for each timeframe are available in each jurisdiction's specific data (click on jurisdiction's name in the summary table).